How does an artist translate, represent and communicate the loss of identity in a society that is no longer stable? Wang Jianwei undertakes the challenge in Welcome to the Desert of the Real, a play that constantly oscillates between performance, videos and theater. 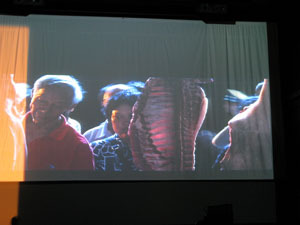 Wang Jianwei tore open the envelope of western preconceptions and stereotypes on China when he presented Symptom in the framework of the film festival Visions du Réel last April 2010 in Nyon, Switzerland (see our article Wang Jianwei’s Symptom at Nyon in the section Pointer At Work). In Symptom, the artist tries to understand China’s contradictions. “It is no longer the way it was in ancient China,” the artist told us during the rehearsal of his play at the Théâtre du Grütli in Geneva. “In ancient China, everything was very simple. Everything worked in a linear way. From one end of the line to the other, there was a common goal.” Today, the reality is less tangible. The artist takes his inspiration from uncertainty. The relationship that we have to people and to events is completely different now. The artist feels the need for a new approach in order to understand Chinese society, its culture and its problems. For him, the search for a method, for a way of representation, cannot be treated as a strict dichotomy: black versus white; pro versus con. Welcome to the Desert of the Real was presented in Basel, Zürich and Geneva as part of a vast program on China offered this year in Switzerland by the cultural organization Culturescapes (www.culturescapes.ch). The Théâtre du Grütli hosted Wang Jianwei’s work for La Bâtie Festival de Genève this September 2010. 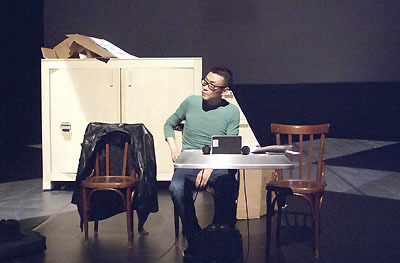 A few hours before the show, we found Wang Jianwei extremely preoccupied with preparations for the evening performance. 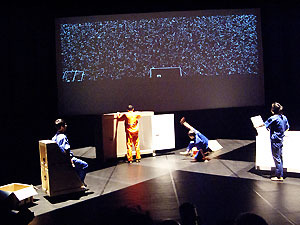 Working in multi-media requires an extreme precision, an orchestration to the fraction of a second, so that the music hits the video image at the right moment, the light brightens the right expression on the face of an actor, the furniture moves in synchronization with the movements of the five players. Wang Jianwei’s technical crew also had to deal with the quasi-religious European institution of “la pause déjeuner” (or lunch time) of the Swiss technical crew from noon to two in the afternoon. But, with a smile, Wang Jianwei nevertheless managed to take the time to continue the conversation we had started in Nyon. With a moderate voice and soft gestures with his hands, he managed to focus our attention despite the noise from the crew and the sound track. We gathered around a small round table in a corridor next to the stage. The walls, painted in black, made the atmosphere more intimate and conversational. The motion-detector light briefly turned off because there was no movement on our part. Wang Jianwei showed no surprise and there was no change in the tone of the conversation. He is in charge of the play; he is in charge of the conversation. Wang Jianwei remembers the impact that Charlie Chaplin’s Modern Times had on him 30 years ago. Back then, he was terrified to see how capitalism played on the loss of identity, the mechanization of people and their profound transformation. “I believe that this is a generalized phenomenon of all societies today,” continues the artist. But if he was more interested in the difference between countryside and city before, today his reflection focuses on the Real and the Virtual, on the Imaginary and The Concrete, on the existence of one individual in relationship to his or her social existence. Welcome to the Desert of the Real is based on a short news story published in a Chinese magazine about a 16-year old boy, who strangled his mother. At first, Wang Jianwei read it without thinking about it too deeply. Gradually, however, he began to realize that “it was a classical story of a family composed of three people, the father, the mother and the only child, who moved from the countryside to the city. In fact, they never really managed to integrate with the city. The only way for the son to reach the dream offered by the city was through the Internet. It was his way of connecting with the Real. The mother constantly repeated that the boy’s reality was to earn money, to take care of himself. At the end, he kills his mother. He no longer has the critical sense of what is real and what is not real. Finally, he may not even have had the feeling that he had killed someone.” The boy had to enter a fictitious sphere to discover his reality and to create a real position in the world. If the story seems simple and even quite ordinary, the way Wang Jianwei presents it on stage is intellectually challenging. The spectators at the opening session at the Théâtre du Grütli were, if not puzzled, quite disoriented. They read the story in a little pamphlet distributed before the play. 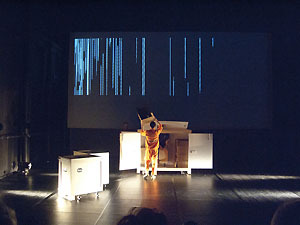 On stage, the linear nature of the story shattered into multiple fragments supported by different media. The audience’s attention had to be on different parts of the stage at the same time. 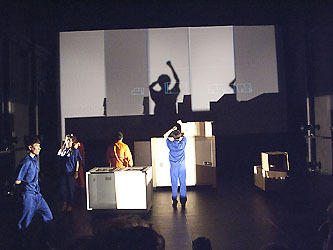 A giant video screen alternated black and white graphics of naïve line drawings of houses, with five short films relating five different stories that seemed, at a first look, to be disconnected from each other. But the stories are offered to us like branches growing from a tree, too fast for us to absorb. Is this reality or virtual reality or a combination of both? Where is the precarious line between the Real and the Virtual? This is a question that Wang Jianwei leaves for us to decide. We can fabricate our own conclusion in the spheres of reality or fantasy. 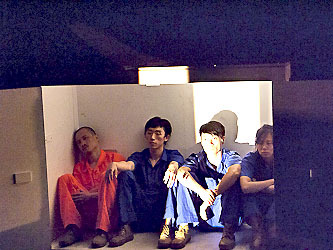 Meanwhile, five actors emerge silently from wooden boxes. A hand appears here, five fingers there, a head and then a foot, a bottom pushing the top of a box while a leg stretches, lifting the side of another box. The body parts emerge and appear in our visual field like icons on a video game. And you are lost because you do not know which one is important, if there is any logical sequence or not, if the game won’t virtually explode in your hands. When the actors-dancers have reconstructed their body, they move, as if they were running amok. Chopped and contorted gestures, walking jerkily with no specific direction as lost in the meanders of the streets and ultimately of their mind. Hope may be there when they walk toward each other. But, at the last instant of an eventual meeting of eyes, they turn around and continue their walk like puppets from which a cord would have been cut. The space on the stage is both busy and ascetic and requires split second attention from the spectator. The starting point of the play - the 16-year old boy that finally kills his mother- is now diffused into an analysis of people who no longer have any connection with real life. The five stories spinning around the short news story, no longer related to the life of only one person. They now relate to the development of the entire Chinese society. Space, Time, Truth and History are the pillars whose foundation needs to be shaken and not rebuilt but re-thought. Zizek uses the collapse of the two towers of the World Trade Center as an example of the realm of virtual capitalism, completely disconnected from the sphere of material production. Before the destruction of the towers, people in America were living in their own reality, a reality that was completely disconnected from the social reality lived outside of the United States. The Americans’ reality was suddenly shattered. The outside world that they used to watch on their television screens like a video came to them. The Third World, “The Desert of the Real” entered and dislocated their vision of reality. Wang Jianwei’s preoccupation is to find a new approach to study the relationship of obedience and enslavement of the human being working for the well being of a society whose structures are in the process of dislocation and fragmentation in virtual spheres. The inner soul of a human being cannot today follow the social and psychological rhythms that are asked from and imposed on him or her. Beijing hosted the world première of Welcome to the Desert of the Real. Wang Jianwei was positively surprised by the audience’s reaction. Spectators connected the play with the recent dramatic events that occurred at the technology giant Foxconn, a Taiwanese company, which employs 900,000 workers all over China. Thirteen young workers attempted or committed suicide between January and May 2010. “ These are people who spend their day by drilling holes in circuit boards and who have no relationship with the person working next to them,” notes Wang Jianwei. “In the dormitories, the person who is going to work is replaced by someone else who immediately occupies the bed. These workers never have a chance to talk with another person. Every day, they lose more and more of their critical sense regarding life.” It is a very high price to pay for China’s development and for the gadgetization of the West -- Foxconn assembles our iPods, iPads, iPhones, Dell computers and Apple computers. (see the blog below by a worker at Foxconn). The short news story, which provides the core theme of the play, is symptomatic of all contemporary societies. Communication, space and time not only compete in the world of globalization, but they also demand that we develop a new model for reflection outside of the “reality” used by states to promote their own development models. Wang Jianwei believes this is the duty of an artist, to ask questions even though they are complex. Some spectators at the Théâtre du Grütli complained that the play was too cerebral, too abstract to be within everyone’s reach. They accused Wang Jianwei of being an elitist. These legitimate concerns are central to an artist’s integrity and involvement. We would like to thank Miss Aurelia Dubouloz for her help in translating the interview with Wang Jianwei. Miss Dubouloz is the author of a comprehensive thesis on Chinese contemporary independent documentary films prepared for the Université de Genève.